The Huawei P30 Pro will reportedly feature a curved display with a waterdrop notch. Huawei is all set to launch the P30-series flagship smartphones next month, but the upcoming smartphones have already leaked multiple times in the past few weeks. Now, alleged official renders of the Huawei P30 Pro that show the upcoming smartphone in a trio of colours have surfaced and seemingly confirm some of its rumoured features. The leaked images indicate that the Huawei P30 Pro will pack quad rear cameras and will flaunt a curved display with thin bezels and a small waterdrop notch. Moreover, purported renders of the Huawei P30 packing a triple rear camera have also surfaced online. Separately, a Huawei product manager has shared a camera sample thought to be clicked by the P30 Pro. The Huawei P30 Pro case renders that surfaced back in December last year also tipped quad rear cameras, but they pointed at a different sensor alignment. The new renders of the upcoming Huawei flagship, which come courtesy of WinFuture, show that the Huawei P30 Pro's rear panel will feature a vertically aligned triple rear camera module, while the fourth camera is located below the flash and the laser autofocus module. The leaked images, which are claimed to be the official renders of the smartphone, show the Huawei P30 Pro in black, sea green, and electric blue colour options with all of them flaunting a gradient design. On the front, the Huawei P30 Pro is shown packing a curved display with a small waterdrop notch and a thin chin at the bottom. As per previous leaks, the Huawei P30 series smartphones will reportedly bring 10x lossless zoom and an in-display fingerprint sensor to the table. 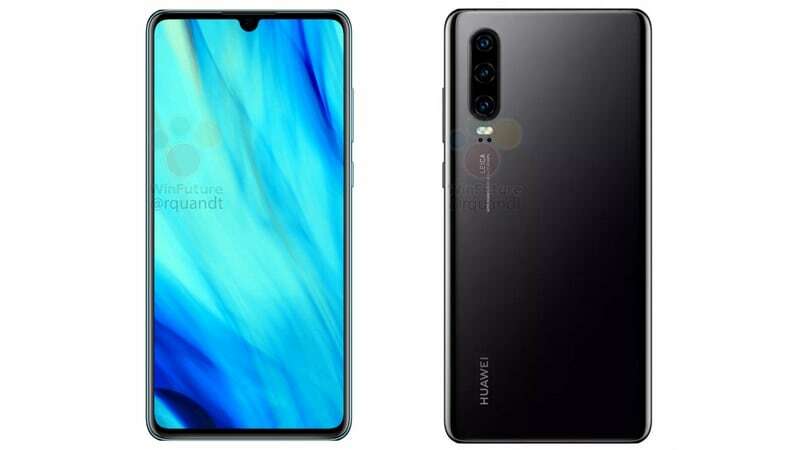 As for the Huawei P30, the alleged renders of the upcoming smartphone suggest that it will flaunt the same gradient design with a similar colour scheme as the Huawei P30 Pro. The main difference between the two smartphones is that the Huawei P30 will reportedly feature a triple rear camera setup and a flat display. Unfortunately, there is no word on the resolution of the cameras and the hardware under the hood. Huawei's consumer business group CEO, Richard Yu, recently shared a posted a camera sample clicked by the Huawei P30 Pro, and in the process, also confirmed that it will pack a quad rear camera setup. Now, Huawei's Product Manager, Bruce Lee, has shared four images of a cell tower that are speculated to be clicked by the Huawei P30 Pro. The four images appear to have been shot in regular mode, ultra-wide angle perspective, 5x zoom, and 10x zoom magnification. However, it can also turn out to be mere speculation and should not be taken as a certainty. We will get to know more when the Chinese smartphone maker officially lifts the covers from the Huawei P30 series at an event on March 26, 2019 in Paris.